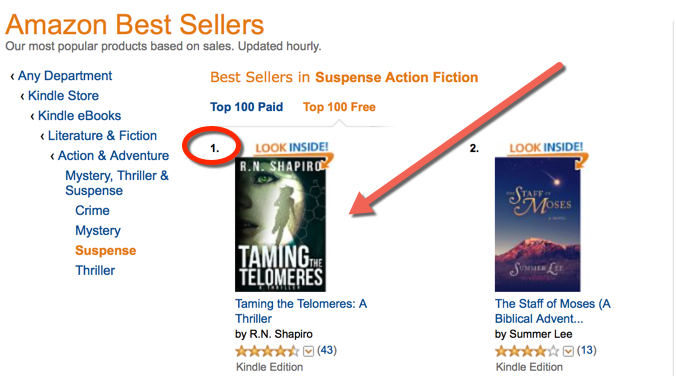 Thanks to all of my Telomere friends who downloaded my thriller, “Taming the Telomeres” (R.N. Shapiro, Challedon Publishing) at Amazon on the June 4 & 5 promo days. I am blown away that TTT held #1 positions for all suspense and suspense action thrillers on June 5, worldwide, on Amazon! I am working on the follow along novel to Taming, which will follow Amanda, Andy and Ron Michaels where the first book left off. Thanks!